Every year we provide thousands of dollars of free care to treat pets brought to us by Good Samaritans and to help responsible pet owners who may be adversely affected by the downturn in the economy. From time to time clients will drop off donations as a way of saying thank you for the loving care that we have provided to their pets. Unfortunately, until now those gifts have not been tax deductible. In answer to this dilemma, Prescott Valley Pet Clinic has established PV Pet It Forward Charitable Fund. Our practice has joined the growing list of practices that have affiliated with the Veterinary Care Foundation (VCF). By establishing our own charitable fund under VCF's charitable umbrella, we can now accept tax-deductible gifts from our friends who want to support our charitable activities. The name of our fund is "PV Pet It Forward"
PV Pet It Forward and the Veterinary Care Foundation are unique in that 100% of every dollar donated goes directly to veterinary practices- the foundation operating costs are totally covered by practice membership dues. 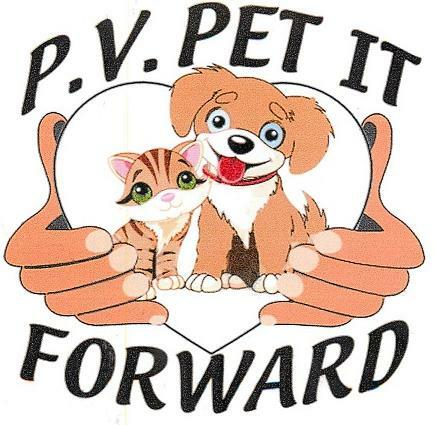 Prescott Valley Pet Clinic is delighted to join VCF and to introduce PV Pet It Forward Charity Fund to Prescott Valley and the Quad City Area with this new opportunity to give back to our community and our companion animal friends. Click here to visit the foundations' website to learn more about how you can help. Donations may be made directly from the website "donate" option. Choose "Donate to a veterinary practice". Or if you prefer, you may make a check payable to veterinary care foundation / PV Pet It Forward. Thank you so much for supporting the proper care and treatment of our beloved small animal companions.